Also serving communities of Northborough, Westborough. There are 11 Assisted Living Facilities in the Marlborough area, with 3 in Marlborough and 8 nearby. The average cost of assisted living in Marlborough is $2,300 per month. This is lower than the national median of $3,346. To help you with your search, browse the 71 reviews below for assisted living facilities in Marlborough. On average, consumers rate assisted living in Marlborough 4.2 out of 5 stars. Better rated regions include Hopkinton with an average rating of 4.3 out of 5 stars. Caring.com has helped thousands of families find high-quality senior care. To speak with one of our Family Advisors about assisted living options and costs in Marlborough, call (855) 863-8283. Three assisted living residences, as assisted living facilities are known in Massachusetts, are available to seniors in Marlborough. Another 33 assisted living facilities are located in nearby communities including Framingham, Worcester and Shrewsbury. At these facilities, seniors receive personal care services in addition to room and board. Personal care services typically include assistance with dressing, bathing, grooming and medication management. 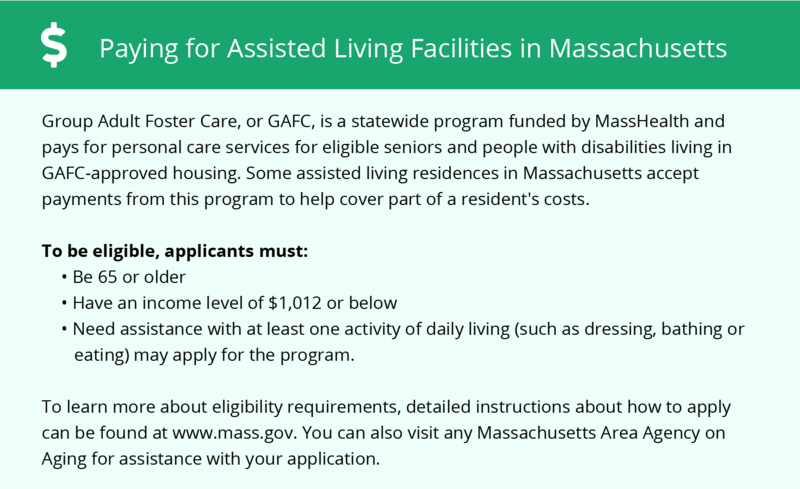 The Executive Office of Elder Affairs regulates all assisted living residences in Massachusetts. •Public transportation provided by the MetroWest Regional Transit Authority provides bus service all around Marlborough, as well as to nearby Framingham, where travelers can make connections to journey to Boston. Local ADA-compliant transportation is available through MetroWest on a reservation-basis for seniors who can't access public bus stops. •The entire state of Massachusetts and the city of Marlborough are both members of the AARP Network of Age-Friendly Communities, meaning that their elected leadership “has made the commitment to actively work toward making their town, city or county a great place for people of all ages,” according to AARP. •Marlborough is home to many historic sites, and theater lovers enjoy performances at the local Ghost Light Players theater. All the museums, concerts and culture of Boston, just 30 miles away, are also easily accessible and many area attractions offer senior discounts. •The Marlborough area is home to world-class medical facilities, including the UMass Memorial-Marlborough Hospital, as well as the UMass Memorial Medical Center in nearby Worcester, in the event of medical emergencies or illness. •Marlborough's weather tends to be hot during the summer, with thunderstorms and intermittent showers breaking the heat. Winter is cold with heavy rain and snow, and freezing temperatures can last until May, which can be a drawback for seniors who enjoy spending time outside. •Marlborough has an array of community resources for seniors, including the the city's Council on Aging, an organization that helps seniors with tax abatement applications and prescription medicine reductions, as well as exercise and computer classes, many of which are hosted at the city's senior center. Assisted Living costs in Marlborough start around $2,300 per month on average, while the nationwide average cost of assisted living is $4,000 per month, according to the latest figures from Genworth’s Cost of Care Survey. It’s important to note that assisted living rates in Marlborough and the surrounding suburbs can vary widely based on factors such as location, the level of care needed, apartment size and the types of amenities offered at each community. 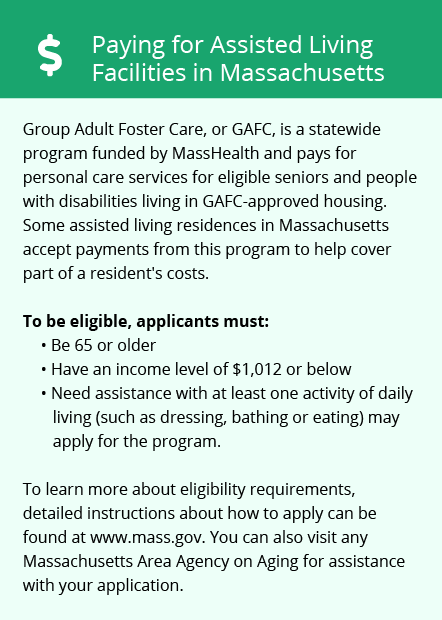 State and federal government resources are available to help eligible seniors financially in paying for assisted living through Group Adult Foster Care, available through Medicaid and Mass-Health, and Supplemental Security Income Category G, accessible through the Social Security Administration. Marlborough and the surrounding area are home to numerous government agencies and non-profit organizations offering help for seniors searching for or currently residing in an assisted living community. These organizations can also provide assistance in a number of other eldercare services such as geriatric care management, elder law advice, estate planning, finding home care and health and wellness programs. To see a list of free assisted living resources in Marlborough, please visit our Assisted Living in Massachusetts page. Marlborough-area assisted living communities must adhere to the comprehensive set of state laws and regulations that all assisted living communities in Massachusetts are required to follow. Visit our Assisted Living in Massachusetts page for more information about these laws.